Life with a head full of yarn. I have had a good knitty week. 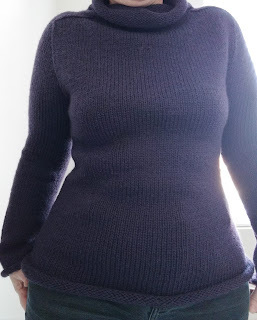 I've finished my Purl Soho Sweater. Blocking was a little hit and miss without any blocking boards or pins and just a few damp towels but it came out fairly well. 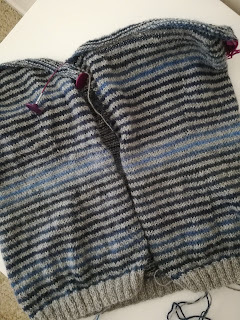 The jumper is a bottom up knit, knit the body, then the sleeves and join them all on the yoke, grafting the underarm stitches at the end. There is no ribbing, just roll back cuffs and neck. 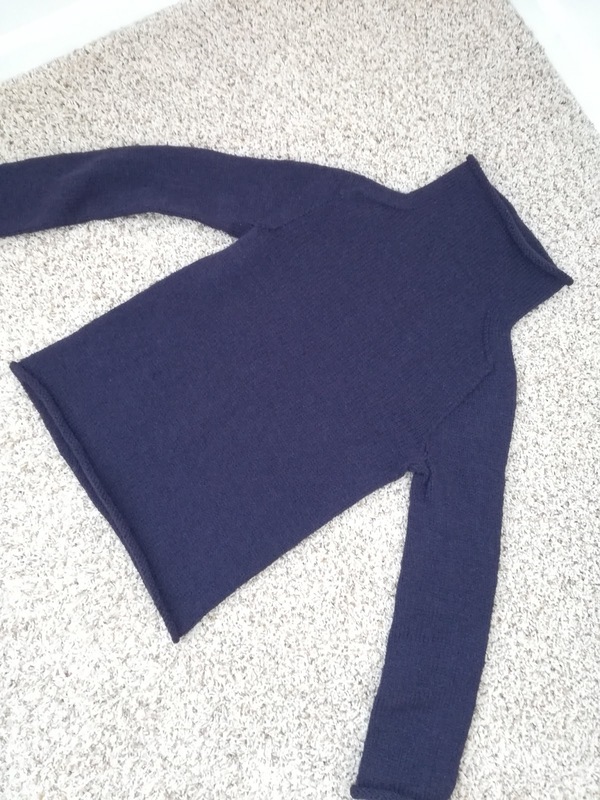 The shoulder shaping was simple to do but looks lovely. Although the pattern has no waist shaping, I most definitely do, so it looks quite curvy when I am wearing it. Can I wear it right now? No, because, of course, the weather has warmed up too much! I'm not really complaining, I sat on our balcony enjoying the sun this morning, although folks south of Chicago had more snow today. I am currently working on another top up pattern. This is a Drops pattern, a cardigan in 4ply; Drops Delight and Drops Alpaca. This is the body, I'm on the second sleeve. I also have some plane knitting socks on the go. 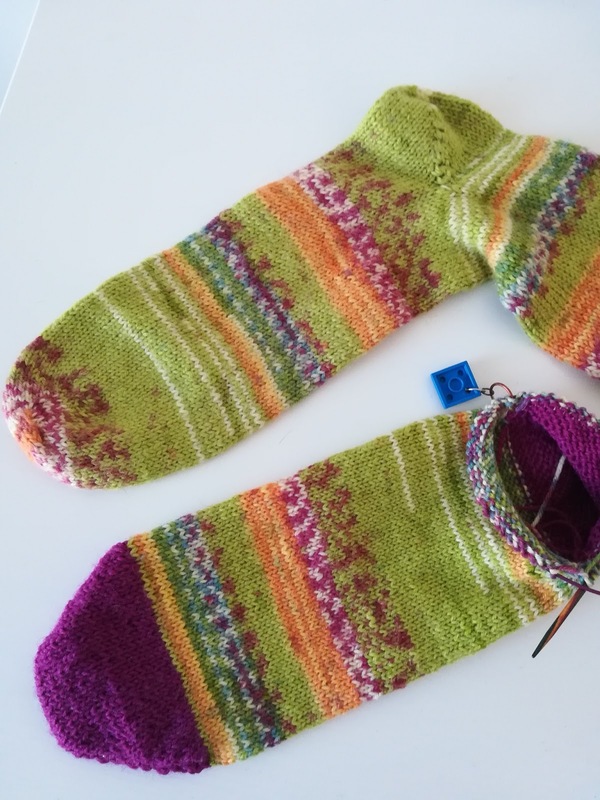 I made the one in the top of the picture last year, Drops Fabel in the guacamole colourway. I'm making another pair but with cerise pink for toes, heels and tops thus enabling me to get two pairs from one ball of yarn. I am using magic loop rather than five needles for these, and I have decided that magic loop is (for me) the best way of knitting on a plane because you can't drop a needle down the side of seat. 2.5mm needles are really difficult to fish out of a seat mechanism, ask me how I know. The pink guacamole socks will be in my bag for a trip we are taking next weekend to San Diego. It's a five hour flight so I will need something to keep me busy. I'm hoping for sunshine when we arrive but to be honest, I'll take anything over 15 degrees F (60 Celsius). That's me for now, have a good week. Your jumper is great and will definitely keep you warm. I like the new jumper you've cast on too, I'm all for stripes. Bravo for a lovely sweater and gorgeous socks. Have fun in San Diego and enjoy the sunshine too! 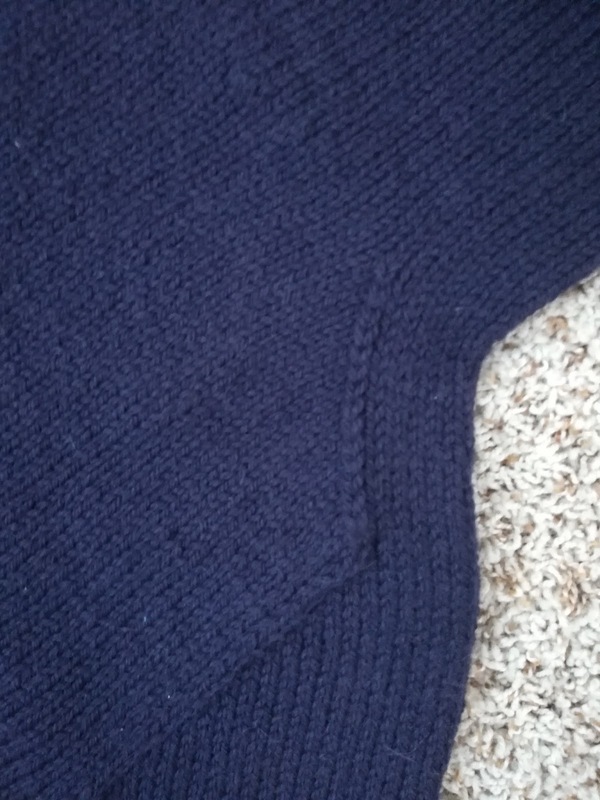 Well done on finishing the jumper, of course you can wear it now, just go for a walk near Lake Michigan, the frigid wind will have you shivering in no time. I love sock knitting for plane travel, using 2 circulars is the way to avoid dropped little needles. 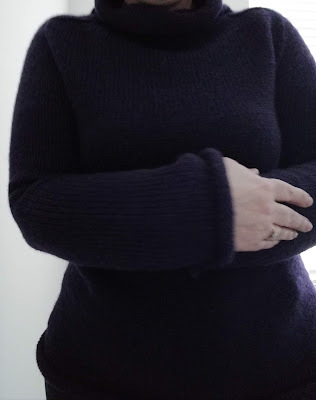 I love the sweater and agree that the shoulder shaping is very effective. I'm going to have a look at the Drops cardigan pattern as I've got some Delight and Alpaca/Silk to use up! Glad to be of help Christine, I’m not doing the lace pattern. Both of your sweaters are wonderful. And I am loving those socks. Have a wonderful trip to San Diego, it is a gorgeous place to visit. Thanks so much for popping in to read my ramblings! Please leave a comment ~ I do appreciate them. Hi there! I'm Clicky Needles 50 years old, I live with my son Master Clicky who is 19, on top of the Cotswolds in Gloucestershire near Stroud. My husband, Mr Clicky Needles currently lives in Chicago and I am joining him soon. I love camping, gardening, knitting, crochet and my family ~ not necessarily in that order. I'm trying to only have 2 projects on the go, but it doesn't always work! I work as a Teaching Assistant in a local primary school. Trials of renovating a a little French house. How Many Times Have People Popped In? and love as long as you live. Some Finished Things and Some Not. Sunday Sevens ~ 14th April.